Ian had the good fortune to graduate from The Yale Law School (motto: don't forget the "The"). In October 2007, for the first time in 25 years, he returned to 127 Wall Street, New Haven, Connecticut. The occasion was his law school class's 25th reunion. Below is the summary of the weekend that he wrote on the plane home and which was published with minor editorial revisions in the alumni magazine. The photos were added later, as were their captions, in italics. 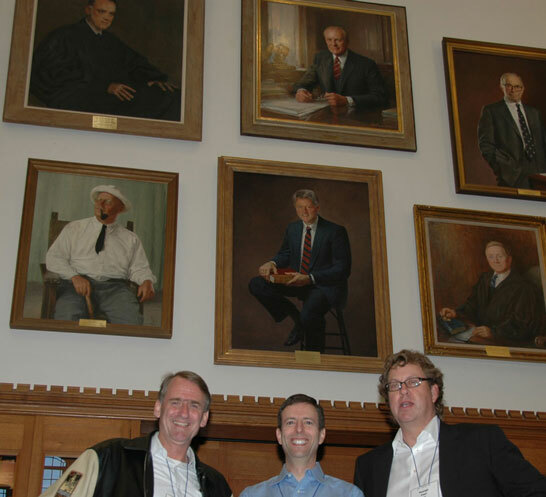 The first shows Ian with Ken Werner and George Paul, two members of his "small group," the first semester group of about 20 students graced with a full professor for a course on Constitutional Law. The three of them are working lawyers, Ken in tax, George in electronic discovery and Ian in contracts. Above them are two members of a rather more select small group, the ex-Presidents. Our reunion weekend revolved around Saturday evening’s dinner in the rarefied atmosphere of the Quinnipiac Club, with its paintings of grouse and setters. I walked in feeling the kind of generalized nerves that preceded the entire weekend: how would it work out, seeing everyone again, many for the first time in 25 years? Would I fit in? Would it be fun, or personally rewarding? No need to worry. The conversation flowed as easily as the wine. Which makes sense if you think about it. We are each in the prime of our lives, whatever the earlier insecurities that may have characterized our time at law school. Each of us has good stories to tell: each of us accomplished things of which she or he is justly proud. 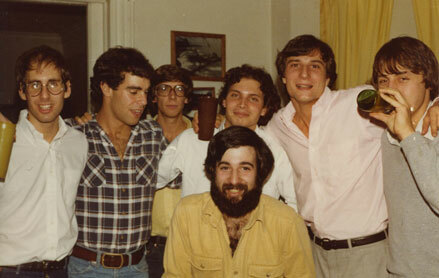 Over 25 years earlier, here is a group at a party. From the left, Bob Zinn, Dave Lowenthal, Rory Little, Joe Nesler, Jon Polonsky (in front of Joe), John Motulsky and Mark Windfeld-Hansen (behind bottle!) Motulsky circulated this photo at the reunion. Thanks John! The groups standing through the cocktail hour began our reminiscences and updates, and we looked each other over. David Lowenthal, the successful psychiatrist, looked like a successful psychiatrist, as understatedly gentle as any disturbed psychotic could wish. Peter Deutsch, the successful politician, looked like a successful politician, effortlessly charming as he pressed the flesh with surprising delicacy. Everyone looking pretty much at ease. We finally sat down, were eloquently regaled by an "a capella" group of current law students, and reminiscing and updating began in earnest, among neighbors and across the table. Here is the proof: Ian actually did graduate! 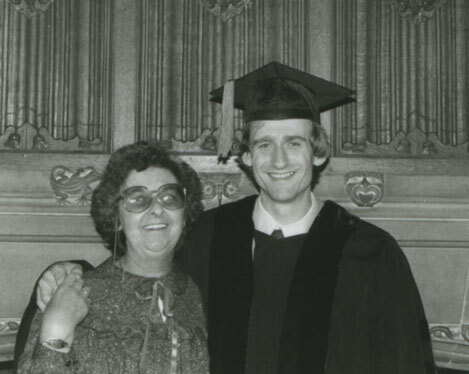 Below, he is with Grandma Stock in June 1982. In order for him to graduate, Grandpa was obliged to pay a little over $100 in canteen and library charges, the first amount that he paid toward that wonderful, but expensive, education. Rory Little started the collective ball rolling, as is his wont and skill, somewhere around the arrival of the main course. He covered some of his memories, offered some restrained self-congratulation on our behalf, made a call for follow-on speakers, and brought me, for one, out of a mellow gastronomic haze by announcing how much the class had raised for the law school. Good grief! You could not discern from the way that this particular group of alumni was acting, but some had obviously been extremely successful in financial terms, bringing up the average gift by several hundred percent so that the aggregate was a quotable record for a 25th reunion class. My personal congratulations are extended to the big givers, whoever you are, for not showing at any time during the weekend that you had made a bundle. That sort of modesty itself is worth its weight in gold. 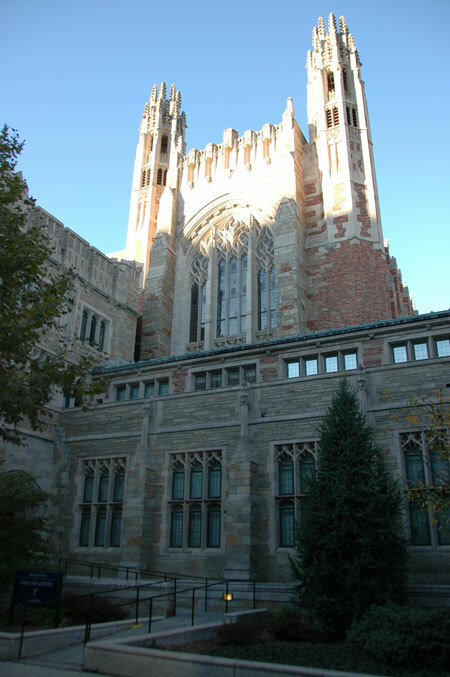 The beautiful law school library, in the tower with the cathedral windows, from Wall Street in 2007. John Motulsky took the baton from Rory, and went through his list of quotable memories. My favorite was the spouse-to-be who looked out of her honey’s dorm room peephole one Sunday morning to make sure that no-one would see her leave, only to trip over Joe Nesler sitting on the floor in the hallway reading the Sunday New York Times! We were certainly not the best ever class, although it was pleasant of Dean Koh to say so as we drank our cocktails. It was equally satisfying that he was honest enough to explain that Guido Calabresi had counseled him to say the same to each reunion class. The less these events are faked, the better they work out. This whole reunion was very little faked, which reflected, I suspect, that we may have been one of the most human classes, if not the best. This year, ten or twelve of us were the only group to walk out of University Commons during the speeches following Saturday’s lunch. This was not because the speeches were dull, although for all that we could hear they could have been. The acoustics were hopeless. At the farthest table from the microphone, we couldn’t hear a word, and so we continued chatting, at reduced volume we thought. But the volume was not sufficiently reduced for the neighboring table, whose occupants began to glare at us. Not wanting to disturb them, and noticing that our table was marked “1992,” we left by a side entrance after a discrete traipse through the kitchen and around stacks of wooden chairs. 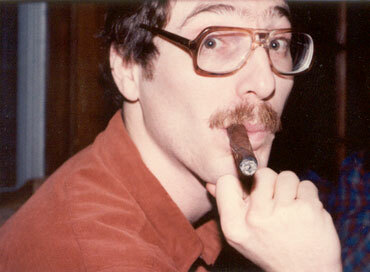 Speaking of the human element, here is Dave Wippman at Russ Hanlon's stag party in 1982. 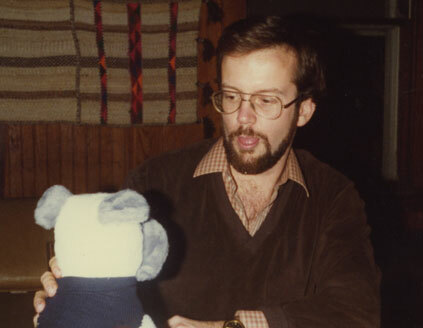 In addition to his Groucho Marx imitation skills, Dave was the Editor-in-Chief of the Yale Law Journal, the most prestigious role to be won by a law student. In October 2007, he was Vice Provost and Professor at Cornell University and, sad to say, could not find the time to reunite with us. Back at the dinner, Gary Mendoza regaled us with two great stories. First, he unashamedly victimized Bob Zinn, remembering how Bob had an uncontrollable tendency to spend 140% of his income. Well, he’s not alone in that! But apparently he spent much of his projected summer associate income from his summer New York firm before the summer, and the gang found some letterhead from that firm. They wrote Bob a letter on it apologizing for restructuring the summer program in the face of business challenges, and alerting him to expect a reduction in his expected income of about 75%. 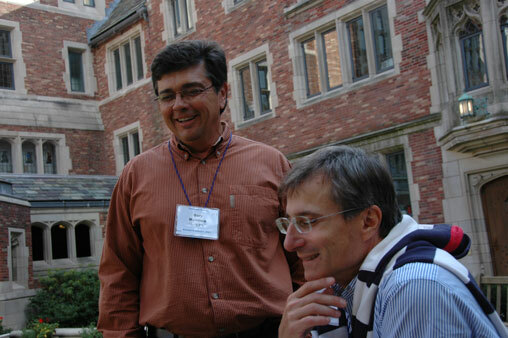 Here are Gary Mendoza and John Motulsky, two of the speakers in the Quinnipiac Club, looking at photographs and reminiscing that afternoon in the law school quadrangle. During his illustrious career, Gary has been Deputy Mayor of Los Angeles and the State of California's Commissioner of Corporations. John picked himself up after a deranged client of the San Francisco law firm where he worked shot and killed several employees, and made a happy home for himself as one of the first to enter the financier's field of distressed debt. Having much rhetorical talent, Gary then brazenly victimized himself. Bob decided to get even by playing his own practical joke on Gary, again involving a letter. Gary was in class of Professor Rostow’s, and had discussed doing a supervised analytic with the professor, but decided to do it elsewhere. Professor Rostow was known for sending letters after grading to students who had done well, well enough for the B+ but not for the High Pass. Bob located some professorial letterhead, and wrote a letter to Gary to the effect that Gary’s work in his recent course would certainly improve (meaning his class work needed improvement) while working on his supervised analytic with Mr. Rostow. In a complete panic, Gary made it to the door of the professor’s office, past his secretary, before he was stopped and told about the prank. 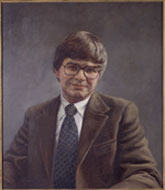 Professor Arthur Allan Leff, 1935-81. A genius who cared. John Steinbeck’s novel “Cannery Row” ends with a wonderful party scene, and Steinbeck waxed eloquent about the life cycle of a good party, distinguishing it from that of the society affairs organized by society hostesses, which he described as something like “about as spontaneous as peristalsis and as interesting as its end product.” This was a very good party, and John Spiegel moved it into the next phase in its life cycle, memories of Arthur Leff and Robert Cover, the two professors who passed away on our watch and whom many felt that we had lost personally. 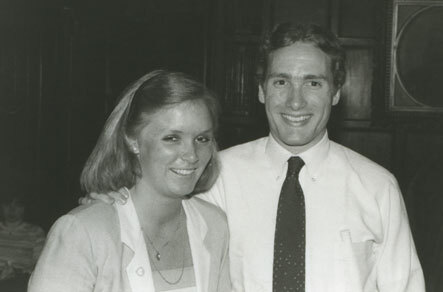 David Boyd and his fiancee at a party in 1982. I knew her as Muffie, but think that her name was Dede. While he was at law school, she suggested that he learn how to play tennis so that he could advance himself in his chosen Chicago law firm. It worked! His career prospered. But his number came up too soon. We don't know the details. This was the sad part of the evening. My mind turned to David Boyd, our classmate who passed away a few years back, and his children, and the noise level dropped in the Quinnipiac Club, as well it should have. Some of us even left before the gentle sense of melancholy had dissipated. 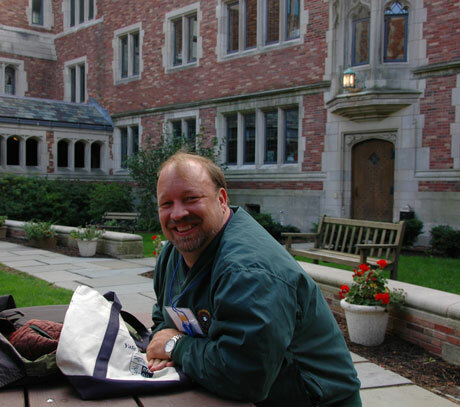 Charlie Reardon, Managing Director at a major investment bank, in the law school's main quadrangle. Our first year at the school, most of us lived in dorm rooms off one of the law school's quadrangles. They have since been converted, regrettably, into offices. Those of us who remained were soon moving from table to table. There had been delicate moments during the dinner, for instance conflicting memories of how high heels had been evoked during a torts class. But everyone agreed that the standard then had been of a reasonable “man,” and soon everyone was pleased to hear from one of the current law students who dined with us that it was now of a reasonable “person.” The party smoothed over the awkwardness and melancholy, and we knew that it was back in full swing when Charlie Reardon began his infectious guffawing again. Here’s how he described his job handling distressed companies, pointing around the table: you get nothing, you get nothing, you get 2%, you get nothing and you’re fired! We laughed until it ached inside. Bob Gilbert in the beach house we shared with Russ Hanlon and called "Hotel California" in 1980 or '81, expressing kinship with the bulldog. I was struck, again, by the sheer breadth in our class, first in the memories and then in the updates. Who was it told us about Bob Gilbert’s intervention in a first year class, defending a fellow student who was being mercilessly picked on by the professor? “Bob, did you graduate?” someone called out. Challenging this particular professor was known to be potentially hazardous, and Bob’s doing so was indeed courageous. I’d shared a house with Bob for a year, and had never heard this particular anecdote. Half the dinner was spent hearing about law school events that I’d never heard, and the other half hearing about what we’d been doing since. It was all quite fascinating, humanly and professionally. Jim Blakey was kind enough to invite Ian to his cottage in Clinton during the reunion weekend. Very picturesque. 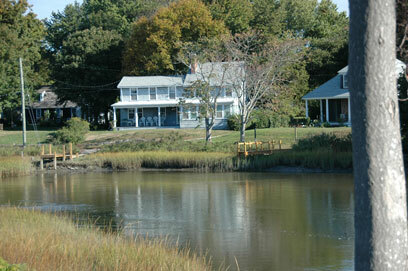 The cottage used to belong to Kate Hepburn's elementary school teacher, proving that we were in New England! The diversity of professional accomplishment was best illustrated for me when talking with Jonathan Macey at the brunch he and Amy so kindly organized for us on Sunday morning. The author of the treatise Macey on Corporation Laws raised the issue of stock option backdating when he heard that I had spent a couple of years with Wilson Sonsini. It was a fair and topical point to raise, but Roger Parloff had already addressed it in his thorough and balanced article on Larry Sonsini for Forbes Magazine: that WSGR had so many tech clients with options backdating issues reflected the simple fact that it had so many tech clients, period. In what other school could a reunion class have had such an easy dialog between the eminent law professor and the eminent legal journalist? 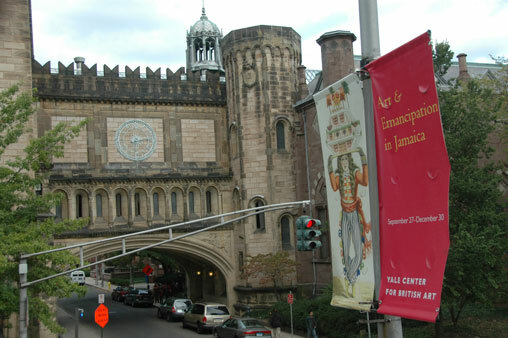 This view of Yale College was taken from the Center for British Art in 2007. The next year, Ian was delighted to be able to point out this scene to the family as Harrison Ford motorcycled under the arch in "Indiana Jones and the Kingdom of the Crystal Skull." For her part, Marie-Hélène has discovered the school through "The Gilmore Girls." The dinner plates were long gone, the last glasses of wine had been poured, and the entire staff of the Quinnipiac Club seemed to be lined up at the door by now, imploring us with their eyes to leave. It wasn’t a reunion for them, after all, and they wanted to go home. The last among us duly departed, the memories still milling around in our heads. Each of us returned from the rarefied atmosphere of 127 Wall Street to the rarefied atmosphere of his or her local sphere of influence. Most of us had not been entirely sure that we belonged at the school when we originally arrived there, although many perhaps felt differently by graduation. It is hard, I think, for a law school education characterized by the Socratic method to be sorely missed. But those of us passing through did establish bonds, perhaps stronger than we knew when we were younger. For one magic moment this 25th reunion weekend, we checked back in and reestablished them. I am looking forward five more years, and ten, God willing. Do come back again, people. Please.